Cardiff rocks. So does this t-shirt. All gone - for now. Sorry! We were feeling perhaps a little reckless (which may have been a side affect of yet another great but instantly forgotten night out in the 'Diff) when we decided to push the proverbial boat out and do a run of strictly limited edition, ultra cool Charcoal Grey t-shirts with a Red Heart I Loves The 'Diff logo in men's sizes to vie with our standard classic white tees for the Coolest Clobber in Cardiff Award*. 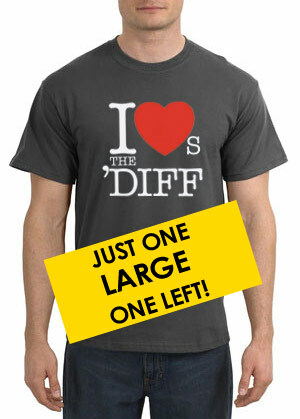 While it can be argued that all I Loves The 'Diff merchandise is limited edition, there were literally only a handful of these grey tees available, which is why they didn't last very long. *This award doesn't actually exist, but in our heads we've already won it two years running (and come runners-up once). We think you'd be off your 'ead (like our model) not to have bought one of these t-shirts. Website content and I Loves The 'Diff™ Logo is a Trademark and Copyright © 2011 Tiger Bay Trading Ltd. All rights reserved.